The Coleman Evanston is our pick for the best camping tent, which can fit up to 8 people and has a rain fly. It has a mesh roofing as well as an easy setup. The polyester fabric does not easily get torn apart during violent weather. Our step-up pick is the Coleman WeatherMaster and it is large enough to fit up to 10 people inside. It uses polyester but with PU coating and is very easy to setup. You can also put some airbeds if you like due to the excessive amount of space inside. The budget pick is the Coleman Sundome and this 4-person tent comes with a rain fly as well as a carrying bag for your trailing needs. It has a dome shape and is quite portable when it comes down to its design. Camping is a great outdoor experience because you get to be in touch with nature. If you have been stressed at work, bummed at home or tired from school then a good camping trip is for you. Bring your family, friends, co-workers, classmates and the like with you for your camping activity. Some activities you can do in camping are: singing songs, roasting marshmallows, telling stories, playing games and many more. Your sleepover outdoors has a lot of possibilities. If you are near a lake or the beach, you can go for a swim or go fishing as well. You could hold birthday parties, anniversaries and many other occasions in camp. Scouting is also an activity associated with camping. You can basically do a lot of things while out in the wilderness and you can have a lot of fun as well. There's nothing more relaxing than sleeping out under the stars in the night sky and becoming one with nature. Children will learn to appreciate nature even more and adults will feel more relaxed as well. A camping tent is a kind of outdoor gear that you can use while you are in the wilderness or in the forest when you need to sleep or stay for the night in a certain location. Camping can be a greater outdoor activity if you pick the right tent for your needs. These tents can shield you from the sun and can also keep you warm during the winter and in the rain. They are ideal for keeping you out of the dangerous elements of nature. Tents can be of any size, such as those with 2 or more doors and even vent holes for electrical sockets and for cooking inside. They can be of any shape, such as those with a dome shape, a pyramid shape or an a-shape. They can accommodate somewhere from 1 person up to a whole group of 10 people, depending on the overall size or dimensions. Some even have dividers so that people can have privacy inside. Some screen mesh parts can also be a great way to view the outdoors without getting bugged by insects (pun intended). Some even have a way for you to see the stars at night. Size of the tent: you have to know the dimensions so that you know whether the tent has enough room for you to stand up or move freely. Trail weight: from 3 to 12 lbs, the trail weight refers to how much it weighs when you pack it up. A lighter one means that you can have less hassle when you carry it around and is good for solo backpacking or camping. Bigger trail weights are ideal for those with a car or vehicle. It depends upon what you can carry so that you will not have a bad back while on the road. Seasons: from 3 to 4 season use, you can choose an appropriate shelter. 3 season ones cannot be used in the winter but 4 season ones can be. It depends on how much you will be using it and how often will it have to stand up against the harsh elements of nature. Consider when and where you will use it before you buy one. Design type: dome, hoop, wedge, pyramid and a-frame are some of the most common design types. The dome type is the easiest to find because of its easy accessibility, which can make it good for a beach or normal summer tent. Pyramid shaped ones are ideal for kids and sleepovers while wedge shaped ones are the best for scouting and general camping, especially in the forest or wilderness. A-frames can also be found on some beach and park camping activities. Sleeping capacity: from 1 to 7 persons, you can choose the appropriate shelter for your needs. Consider who will sleep in it before you buy one. Assess how many members of your family or group can fit inside and if there is extra space to clearance for anyone to stand or move around to fix their items. Having a lot of space inside makes it easier for you to do things during camping and makes life easier. You should consider a roomy shelter before you purchase one so you have more space for your gear and other items. Number of doors: from 1 to 3 doors, you can choose the appropriate number of doors based on how many people will sleep inside. Having more doors makes it easier for anyone to access the shelter but you should also consider safety features when you close the door to avoid intrusion by others (especially bears and other wild animals if you're at a park or in the forest). Consider doors that are easy to operate, fasten and lock when needed. Pole material: fiberglass, aluminum, steel and carbon fiber are some of the most common pole materials for your shelter. The pole is the very foundation so make sure that it is made of durable, rust proof and flexible material that can withstand the elements. Aluminum is great for the trail if you don't want something that is too heavy, and is a budget option. Steel is for durability purposes and for when rusting is not an issue. Fiberglass is the best, if you can afford it, due to its flexibility, lightweight feel and resilience. Carbon fiber is also similar to fiberglass, so that is another option to consider. Color choice: the color of your shelter also matters because it should be highly visible at night to let you know where it is, in case it is very dark out and you are unfamiliar with the place or area (e.g. in a forest). Consider bright greens, yellows, reds, oranges and whites when you choose a color so that it will be easy to find at night or when it rains. Ensure that the color id also fade proof when you expose it to the sun and the elements. Who will use the tent: it can be used for children, adults, teens or seniors. Consider who will occupy the shelter so you can estimate the size as well as the color, style and shape. Most children can fit even on small adult shelters and they may be interested in unique characters or designs. Seniors or those with health issues should have a shelter with easy access features so that they will not have trouble getting in and out. Leak-proof: consider a shelter that is leak proof during the rainy days or any bad weather elements outside. Consider this if you want to sleep cozy as much as possible in the shelter, especially if you need to set it up on a very rainy and stormy time of the day. There should be complete sealing mechanisms in the shelter so that no part would get water, especially the flooring. Purpose of camping: some tents are for "glamping" which basically means that they are associated with luxury and are meant not to be too much in the wilderness and closer to civilization. Most, however, are for general camping as well as for scouting and backpacking. The Coleman Evanston is our pick for the best camping tent which is made with polyester for its body. It can fit up to 8 people inside and has four large windows for easy viewing of the great wilderness. It has a rain fly for protecting against the elements. The weathered system of this shelter makes it ideal for nearly all seasons. It has a good set of fiberglass poles. The only concern but not a deal breaker with the Coleman Evanston is that it's only intended for large groups so it's not ideal for solo backpacking. The Coleman WeatherMaster is our step-up pick, which has a center height of 6 feet and 8 inches. It uses a patented welded system for the flooring for keeping it leak proof in violent rain. The polyester material has a 75D quality at 450 mm. Its rain fly makes it ideal for bad weather as well. Our budget pick is the Coleman Sundome, which is a 4-person tent that can have two color choices for your needs. It has a dome shape and measures 9 x 7 feet in total. It is great for those who want to do some light backpacking needs and you have a small group. 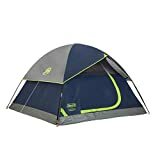 For single person use or for solo backpacking, the ALPS Mountaineering Lynx is a great camping tent that has a single door entry, easy setup and uses 7075 aluminum stakes for durability and a lightweight feeling while trekking. It has a single vestibule and a sealed fly for leak-proof camping. The Coleman Tenaya Lake can take up to 8 people inside and has a 9-minute setup. This roomy shelter has a closet for organizing your clothes. You can stand up easily with a center height of 6 feet and 4 inches. It uses a fast pitch system and comes with color coded poles for easy setup. The Napier Enterprises BACKROADZ can be used at the back of your SUV in case you don’t have enough ground space for a tent. This convenient shelter can help make the use of your vehicle to have an instant sleepover recreational vehicle. It is made with polyethylene on the flooring and it has a rain fly for the rainy days. It is a 3-season shelter with four windows and a single door. Polyester makes up the rest of the tent. The CCTRO 2 Person is a great waterproof shelter that can be used during the rainy days as well as in light snow. You can choose between orange and blue colors and it has a dome shape. It uses fiberglass poles and comes with 210-denier oxford for the flooring to keep it leak-free. If you want an American Indian themed party or campout with the kids then the Pericross Kids Teepee is a great choice for you. It has a striped design and has a traditional teepee design. Made of cotton, it is a natural shelter for the kids to enjoy. The Toogh 3 Season is a pop-up shelter that can fit up to 3 people and can survive up to 3 seasons in a year. It has two doors and is made with 190T polyurethane for the body with a floor made of 210D oxford to keep it away from leaks. 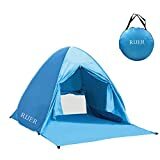 The RIJER Automatic Pop-Up is a great shelter to take with you to the beach. It is a pop-up tent that can be super simple to setup and has UV rays protection with its design. It has a zippered door and has enough ventilation due to the nice looking curtains. Others that were not included in this list were substandard in their pole material and were not very easy to setup. They were also pretty bulky to carry around and not ideal for backpacking and/or family camping trips. Q: What are the benefits of camping? Camping gives you nothing but fresh air. You get to breathe the cleanest and purest air if you are outdoors in the wilderness. There’s nothing like fresh air to breathe once in awhile after all of that pollution in the city or town that you are in. You get to socialize more with other people. Socialization and bonding is one of the greatest benefits of going on a camping trip. Whether it’s you and your significant other or if you’re in a group of friends, family members, classmates or if you’re on a team building activity, camping is a great way to meet people – even other campers nearby! It’s a fun way to exercise due to hiking and trailing activities. In camping, you can do all sorts of stuff – from fishing to hiking to going up the hill to look at the world below. You not only burn carbs and fat but you also get in shape even better with camping and hiking – and you won’t even notice it! You get a dose of Vitamin D. Sunshine is one of the greatest benefits of going on a camping. When you sit on your shelter and watch the sunrise from the beach or from the forest, it’s not just a majestic sight but it is also good for your skin and your immune system. There’s nothing like sleeping outdoors under the stars in quiet nature. It is said that when you look up in the stars at night on a very quiet and remote area, you think about how beautiful life really is and how there are so many stars out there and how we’re only a small fragment of the universe. It helps you relax and be happy with your life. You’ll feel stress-free with camping. If you have been stuck with a strict boss, unhealthy deadlines and being stuck in a desk job often then going camping will help put your mind at ease. For those who need to unwind after getting bummed at home or in school, a great vacation activity would be camping. Foods that you cook won’t have as much grease as they do when cooked indoors. Because you will most likely grill or roast food instead of cooking them (unless you have a backpacking stove), you will get less grease from food because of the way the food is cooked. In addition to that, foods can retain better nutrients because they are cooked slowly instead of hasty cooking. If you or someone is suffering from depression, camping can help lighten things up. Depression is no joke and it should be treated with a relaxing therapy that you can help bring to someone. Everyone is going through something and tough times are always abound for anyone in life. Camping can help improve your mood or the mood of someone you care about. Sleeping under the stars will help them relax and realize the beauty of life again. There’s nothing like taking on a brand new adventure of your life! Everyone is always hungry for something new in life and one of the best ways to help satisfy your craving for adventure. You can go fishing or do many other things such as hiking, mountain climbing, trekking, trailing and many other activities. There are so many possibilities when you go on a camping trip. Q: What is the importance of having night lighting for your campsite? · Having lighting in your campsite can keep you safe from intruders. · It helps you to easily locate your campsite when you get lost. · You can work faster even at night to clean up your mess and even cook. · It brings a good mood to everyone at the campsite. · You can alert other campers that you are in the campsite. · Any lighting can be used for emergency purposes as well. Consider the lumens or the brightness of the light. This is often seen in the packaging of the light bulb or the lighting solution. Brighter lumens can be achieved with LED lights. You can go anywhere from 80 to 250 lumens or even more, depending on how much you need to light up in your camping space. Battery powered ones should have an easy to access battery. You should consider one with AA or AAA batteries if you are going on a camping trip. Lithium ion is also okay if you want to consider the longevity of the battery, but take note that it can be hard to find in a remote area in case it gets damaged. Going solar is also a good option. You can help mother nature and use the renewable energy of the sun so you can have lighting at night. Most solar lighting solutions are available everywhere and they can be great for camping purposes. If you use campfire for lighting, make sure you put it out before you sleep. This is common sense for all campers out there because even the slightest ember cam potentially spark a forest fire or beach fire and set your camping gear ablaze. Q: What do I need to prepare before going to a campsite? Consider the amenities in the campsite. You should know if the campsite offers easily accessible water. If you want to go with electricity for any reason whatsoever, you should check if that is available in the campsite as well. Some parks and campsites also offer barbecue spaces for free. Test your camping gear if it works. If the poles don’t work well then it’s back to the drawing board, or you can consult the user’s manual to see if there’s anything that you missed. It doesn’t hurt to test your tent first before you bring it into action – and test the rain fly that comes with it. You should also practice setting up tent so that when you go camping, you won’t have a lot of problems. Look for any possible threats in the campsite. Consider if there are wild animals such as bears that might threaten your safety. You should also consider if there are poisonous plants nearby that you might mistake for food. You can check with the local authorities as well if there are other dangers nearby in your target campsite. Know the rules and regulations of the campsite. Some parks and campsites do have fire bans, which can be bad news if you wanted to roast marshmallows with your friends. Always keep your trash with you when you pack up, so make sure you have a trash bag with you when you go to the campsite. Know if there are also other prohibited things in the site before you go there. Ensure good lighting at hand when you go to the site. Bringing any lighting solution is a good way to spice up your camping experience. This is especially the case if there are fire bans in the campsite. You can go for any lighting solution so you can sleep well at night. Find out if it is going to rain when you go to the campsite. At any case, you should still prepare by bringing jackets, raincoats, a rain fly for your shelter or even an umbrella – anything to protect you from the elements other than being in your shelter. Bring ropes for hanging wet (and dry) clothes. The rope will serve as a clothesline in case you get wet under the pouring rain and can help dry your clothes. You can also hang clothes easier if you have one for your shelter – some of them can have clothesline spaces for you to use. Ensure your camping stuff are of heavy duty. Consider a high quality cooler that doesn’t leak out water or make your drinks not cold enough anymore. There are also many choices for a shelter to consider with its pole material, fabric material and other aspects. They should be resilient against bad weather and won’t fail you when the going gets tough. It doesn’t hurt to bring hygiene kits. Even the smaller things can be taken with you on your trip, such as alcohol, a hand sanitizer and others. Some “glamping” situations can allow you to bring the things that you would normally bring with you to a hotel or luxury trip. Bring necessities like your phone and extra money. In case of emergency, you need money to buy some items and also for transportation. You also need your phone to call people in case something bad happens. Always take care to place your important items in a bag or pouch that you’ll always carry around in the campsite. Q: What food options can be great for camping? You can prepare canned beans, mushroom soups, corn soups, sardines and ready to eat items. Canned goods are the staple for most camping activities in any part of the world because they are the easiest to prepare and don’t expire too easily. They are the easiest to prepare when it comes down to juices, coffee and the like. You can also pack tea bags for easy preparation. Drink powders offer less mess, especially if you’re with kids. These can be ideal for those who don’t know what to prepare or to pack, as a trail mix comes with assorted items that you can pack while you’re on a trail, such as cashews, chocolate candy, wafers, nuts, legumes, raisins and the like. Granola bars are great for the teens and adults who want to stay fit and go camping at the same time. Granola bars are super easy to eat and pack, and will keep you full of energy as well. You can pack some peanut butter and other sandwich staples. In fact, sandwich making at camp is also a great activity for the kids when they help out. Q: What are the different shelter materials to consider? · It is a great water absorbing material, especially the cotton. They are great for handling condensation. · It helps you to insulate during winter and keep you cool during the summer season. · It does not make much noise during a windy day due to the sufficient weight of the material. · You won’t get the bad smell of chemicals that have been usually seen on man-made nylon. · UV rays can’t easily get through your shelter with canvas and cotton. · Canvas and cotton require a process called weathering for it to be a great shelter under the rain or storm. · It is usually pricier than nylon fabrics because of the quality. · They can be bulky and heavier to carry with their trail weight. · You also need to maintain then even more than regular nylon fabric. · They may not be tear resistant compared to nylon fabric. · You don’t have to pay a lot to buy yourself a nylon or polyester shelter due to the cost of the materials. · They are also very weather resistant and leak proof due to the design. · They are also tear resistant compared to cotton and canvas, which is great if you have kids around or if there’s a big storm coming up your way. · You don’t have to carry around a large and bulky packed shelter to the campsite with this kind of material with you. · It’s not that breathable compared to cotton and canvas, and it might smell bad at times. · Because it’s lightweight, it will tend to get noisier during windy days and flap around when you try to sleep or relax. · They don’t have the same insulation properties as cotton and canvas does. · The UV rays of the sun may fade the color and quality of the material. Q: What are the different shelter poles to consider? · They have good flexibility that can withstand high winds and storms. · They are easy to replace when they break. · They are not so expensive. · Some weaker fiberglass can potentially break ahead of time. 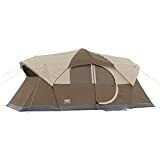 · They are only ideal for tents that aren’t too big. · If you want strength then this is a good choice. · They are very rigid so they don’t easily topple down or break apart. · They don’t come at a high cost as well. · You need to consider corrosion as an issue. · They can be a bit bulky to carry on the trail. · It is very rigid and does not easily break when you put it against high winds. · Aluminum alloy is ideal for humid areas where rusting is a major concern. · The strength to weight ratio is just fine as it is lightweight but durable. · It may not be that cheap compared to steel and fiberglass. · Not all aluminum alloy poles are completely rustproof. · They are easy to pitch. · They don’t need a lot of maintenance in the long run, compared to other pole materials. · Air pressure can change over time during the course of the day. · Air tube shelters can be bulky to carry in the trail. Q: What is packed weight and trail weight? Trail weight: this involves the shelter’s body as well as the poles and rainfly. It does not involve the other accessories like the guy lines and patch kits. Packed weight: this involves the whole shelter including the poles, rainfly, guylines, stakes, patch kits and everything in between. While trail weight is a good measurement of carrying your shelter, packed weight is better because it includes everything that you may need to pitch it or to make some repairs. Q: What’s the difference between 3-season and 4-season? A 3-season shelter can be used on spring, summer and fall (not on winter). They are great for light rain and some snow but not entirely large heaps of snow or snowstorms. They aren’t meant for typhoons and hurricane like conditions. They will usually have mesh panels, more headroom for you to move around and will use lighter fabrics and materials to make the trail weight and packed weight lower. A 4-season shelter is ideal for violent storms, winds, snowfall and the like. They are mostly made out of heavier fabrics and can have ground extended rain fly setups. The dome design of these shelters can be ideal to withstand these high winds and they also don’t have much mesh panels to keep you warm and cool during a snowstorm. The dome design also keeps the snow from piling on the top. A 3-4 season shelter is a hybrid of the 3-season and the 4-season shelter, which has more poles for better durability against snowstorms and some violent rain. They can be used in moderate snow conditions such as in late fall or even in early spring season. You can also take them to higher elevation places such as those in Europe or North America. They’re great for mountain camping. Q: What tent shapes are available? · Dome – this is the most common shape and is great for keeping the snow or rain downwards instead of piling at the top. · Ridge – this is the classic type that can be hung from two trees and are usually one-person when it comes down to size. · Geodesic – these are the crisscross types when it comes down to the top shape and design. They are great for mountaineering. · Quick pitch – these can automatically pitch by themselves and are ideal for family campouts and those times when you absolutely need to pitch a shelter. · Inflatable – these are also similar to quick pitch ones but they need to be inflated. · Tunnel – these are ideal for those who need some extra space, and are ideal for larger campsites. · Khyam – this new type of tent is also called the elbow joint or knuckle type and is similar to a dome shape but with an open front with a fly. · Vis a vis – they are similar to tunnel shaped ones and have an annex room on both sides. · Pods – they are ideal for those who want to enjoy the summer due to the large amount of screened windows. They are good for larger families and campsites. 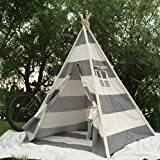 · Teepee – some teepee tents are still available out there for you to use, especially for festivals or for camping with the kids. Q: How do I ensure that the door of my shelter is good? · Zippers – you should go for quality zippers so that the door does not give you a lot of hassle in opening and closing. · Noise levels – some doors can be noisy when you open and close them, which can disturb others who are sleeping. · Number of doors – you should go for many doors in your shelter so that you can easily enter and exit even when other people are sleeping. Q: What is the footprint? A: The footprint is the extra layer on the bottom or the flooring of your shelter, which acts as a waterproof or leak proof addition to your camping experience. They are great for the rainy days and they can also help improve the lifespan of your shelter. Q: What’s the difference between single and double wall shelters? A single wall design is the most common because they usually have easier setup and are remarkably simple to pitch with a few stakes and poles needed. A double wall design is ideal for mountaineering and cold weather. You can also use the outer wall of this design as a quick pitch setup involving the footprint and the fly without the walls. Q: What does berth mean? A: Berth refers to the number of people that can fit in one shelter but without the extras like the bags and the other gear. When counting berth in camping terminology, you should always include your bags as a single berth. Q: What is the no-see-um netting? A: This kind of netting is mostly seen in a lot of shelters today because it can help in the summer to reduce the likelihood of insects such as the small biting fly or the no-see-um fly that is often found in the summer season. Q: How do you set up a tent for occasions? Q: Do shelters differ in how many people are needed to pitch them? A: Yes, most shelters need 2 to 3 people to pitch them but some can be solo pitched. You have to know whether you are pitching solo or you have a group of friends or someone with you to pitch the shelter. Do know that larger ones may need 3 or more people to pitch, especially family sized ones. Q: What is the vestibule and what is it used for? Q: What properties make a camping shelter ideal for the winter? Q: Where is a good place to pitch your shelter? A: Consider flat ground when you want to pitch your shelter. It is much easier to pitch on flat ground than on rocky or inclined areas. However, there are instances that you may need to pitch it on uneven ground during emergencies, but as much as possible, make sure it’s flat and easy to clean up. 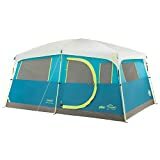 To wrap it up Coleman Evanston is our pick for the best camping tent because of its good 8-person size, tough polyester fabric and ease of setup other than its durability, which can last for many years to come.